This translation of Shoyo Roku with commentaries is a companion to The Blue Cliff Record. Reprint. Amazon.com description: Product Description: Book of Serenity is a translation of Shoyo Roku, a collection of one hundred Zen koans with commentaries that stands as a companion to the other great Chinese koan collection, the Blue Cliff Record (Pi Yen Lu). 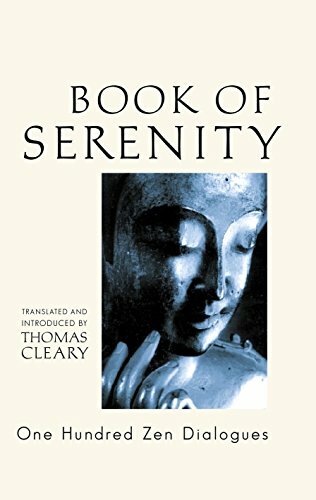 A classic of Chan (Chinese Zen) Buddhism, Book of Serenity has been skillfully rendered into English by the renowned translator Thomas Cleary. Compiled in China in the twelfth century, the Book of Serenity is, in the words of Zen teacher Tenshin Reb Anderson, "an auspicious peak in the mountain range of Zen literature, a subtle flowing stream in the deep valleys of our teaching, a treasure house of inspiration and guidance in studying the ocean of Buddhist teachings." Each one of its one hundred chapters begins with an introduction, along with a main case, or koan, taken from Zen lore or Buddhist scripture. This is followed by commentary on the main case, verses inspired by it, and, finally, further commentary on all of these. The book contains a glossary of Zen/Chan terms and metaphors. About: This translation of Shoyo Roku with commentaries is a companion to The Blue Cliff Record.